(Left) Buddy being treated at Peninsula Humane Society and SPCA. (Right) Buddy waiting to be adopted. Buddy the dog was found in the foothills of South San Jose undernourished with tangled fur and a body littered with ticks. Despite teetering on the brink of death, Buddy has since been scooped up, cleaned up and is now up for adoption, according to the Peninsula Humane Society and SPCA. 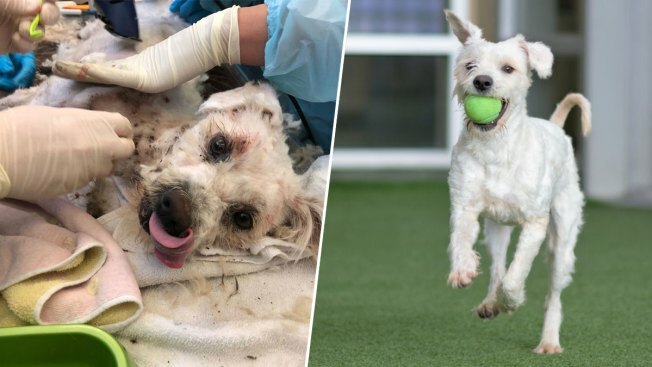 Buddy, believed to be Soft Coated Wheaten Terrier and about two years old, was first discovered "struggling to survive" in the Silver Creek Valley neighborhood of San Jose, according to the PHS/SPCA. Concerned for the pup's well-being, a resident left food out and tried for roughly two weeks to catch him. "The dog was extremely frightened and had been living an almost feral existence in the foothills of [the resident's] neighborhood," PHS/SPCA's Communications Manager Buffy Martin Tarbox said in a statement. Thanks to the resident and the PHS/SPCA, Buddy was eventually corralled on March 30. "Without the kind-heartedness of the resident to help him, it is doubtful he would have survived much longer," Tarbox stated. Buddy, who received his name courtesy of the worried resident, was not microchipped when he was captured, and no one claimed him, according to the PHS/SPCA. Buddy spent four days at the San Jose Animal Care and Control shelter just in case someone came forward to pick him up and return him to his home, but no one ever came looking for him, according to PHS/SPCA. He was eventually handed over to the folks at PHS/SPCA. Staff members were able to shave away his matted fur and get rid of the ticks. He continued to receive further medical and behavior treatment for the next several weeks until he was determined fit enough to be placed on the adoption list. "Buddy is a true survivor," Tarbox's statement indicated. Buddy, who is neutered, vaccinated and now microchipped, is available to be adopted at the PHS/SPCA adoption center located in Burlingame. His adoption fee is listed at $120, according to the PHS/SPCA. Those interested in adopting Buddy can not have any other animals or small children.